WESTWORD : The question on the table: How to create a more sustainable cannabis industry? 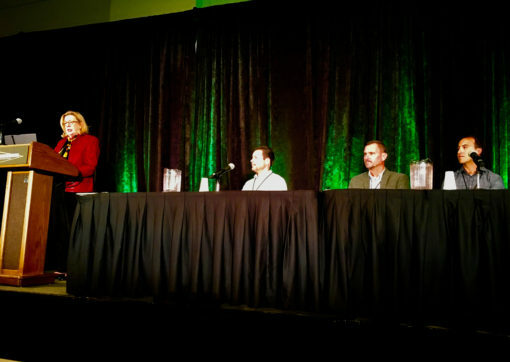 Over 200 people gathered at the Colorado Convention Center for Denver’s Cannabis Sustainability Symposium on October 26, attending panels, hosted by the Organic Cannabis Association, on a variety of issues related to environmental efficiency and discussing how to best tackle sustainability issues. The first panel discussed how to tackle high-energy costs and improve equipment to make it more efficient. “There are key best practices that can help cultivators become more energy-efficient. The fact is that people in this industry want to do the right thing by implementing sustainable practices. They just need the tools and the information to do it, and that’s exactly why we’re here today and why this conference was developed,” said moderator Meg Collins, vice president of business development at Good Chemistry.